I am really back in collage mode at the moment, think it's something to do with the fact I am having to work on the dining room table and it's easier to have bits of paper and some inks and stamps round me whilst the rest of my supplies are stashed away in boxes. I loved putting this one together for Jean at Crafty Individuals. This is such a sweet stamp image with the butterfly and ticket and as you can see I added lots of fairly plain papers and bits to frame it. The stamp was coloured with watercolour pencils and wet brush. The heart was cut from a coffee shop cup sleeve. I had in mind the Lace Love challenge at Simon Says Stamp and Show whilst I was making it and added a strip from the Tim Holt 'Decorative Strip' die as well as adding a small piece of real pink lace and a piece from a doiley. 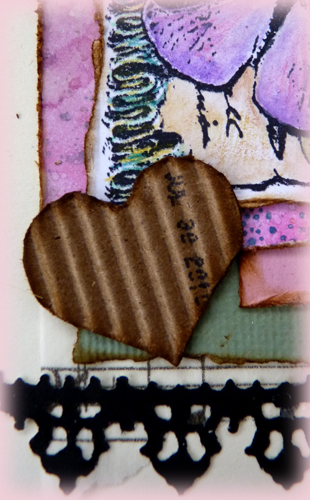 ......... and I glued everything straight onto the card itself - no mount!!!!! I hope you are not too affected by the snow today. It has just stopped here and we have 3 - 4 inches, but I have stayed in the warm and not ventured out at all. A really beautiful textured creation Brenda and so pretty. Glad to see someone else uses those coffee holders too. It's been snowing here since 7am and is still going so we have the same amount of the white stuff plus a wicked chilly easterly wind. You take care too have have a lovely weekend. 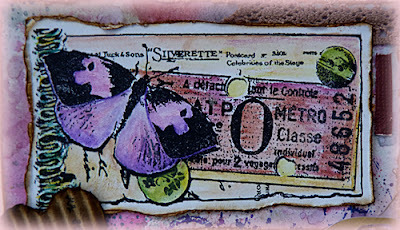 Brenda this is gorgeous I love all the texture surrounding the lovely butterfly and tickets image.Wonderful colour on the butterfly! I've never used a coffee shop cup sleeve... probably will now! Hi Brenda...what a lovely project...here the snow is also about 4 inches high and it is very chilly...so I stay at home most of the time...hope your craftroom will be ready soon! Tomorrow our daughter and her friend are coming by to plan our California holiday in September! What a beautiful collage, Brenda! Love all the different textures you've used... all the lacy edges add so much to this stunning piece. I love it. oh wow.. a collage based on a professional scrappers hand! Loving your wonderful collage Brenda. How cool, great use of all the paper bits. A wonderful collage. 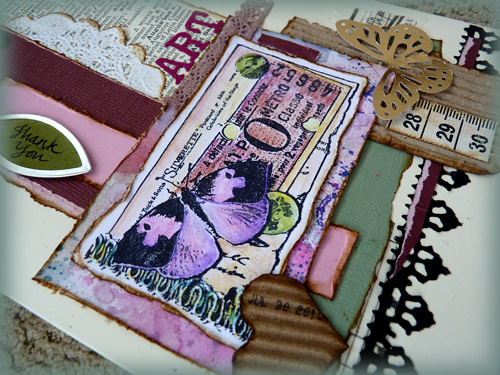 HI Brenda, your collage is beautiful, love the structure of it, the elements especially the lace, the die cut border and of course the butterflies - really beautiful. wow this is a fabulous collage! Love the colors! Have a great weekend! 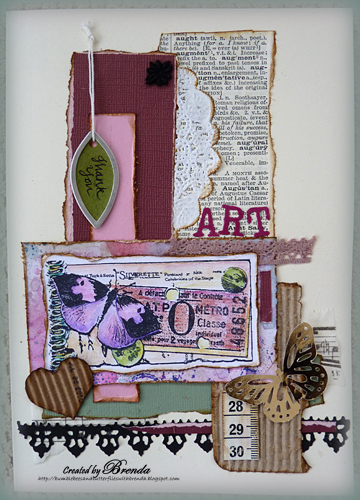 Brenda, the butterfly collage is so inviting of Spring and warmer weather! Totally gorgeous! I love all those layers and colors! Wise to stay in and hopefully you did a bunch of crafting! Have a great weekend! Hugs! Gorgeous work, Brenda! Wonderful selections of layers framing your beautiful image. This is so up my street Brenda........I so love the texture and all the elements pieced together so beautifully. Beautiful Brenda and inspirationl as always. WOW!!! Love this piece Bren, it's delicious! This is fantastic Brenda and such a fantastic layout to it. Fabulous - love how you have brought the different elements and layers together.